The three biggest threats to your health on holiday are probably Sun, Sea and Alcohol. Regulate the time you spend in the sun and use a sensible Sun Protection factor. Sunstroke or sunburn can be very unpleasant and will ruin your holiday - skin cancer could kill you! 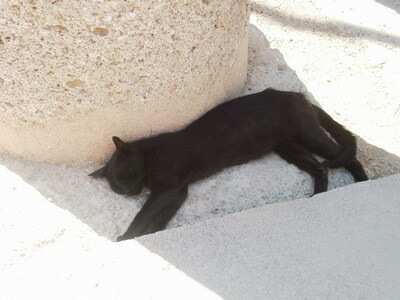 Make good use of the shade! Take care in the sea, too. Avoid swimming after meals and if you've had a skinful. Alcohol is no safer partner with the sea than it is with the heat. 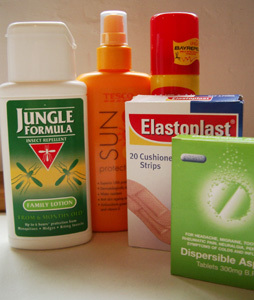 Don't forget your sun protection, after sun, insect repellant (or something to deter mosquitos), cream for bites (Anthisan is good), plasters, pain killers and any prescription medicine you may need. Also - make sure you have a "European Health Insurance Card" (EHIC), which has replaced the E111. You can get a form from the Post Office. You can read about the EHIC and what benefits it will give you here. Whatever happens, if you are charged for any services, make sure you secure a receipt with a number perforated across it and the name of both the clinic and the doctor. It is advisable to take out insurance which includes air rescue to bring you home in an emergency. Not all policies have this! There is a new and well equipped medical centre (Krito) near the Amphitheatre Night Club on the crest between Lindos and Vliha.. 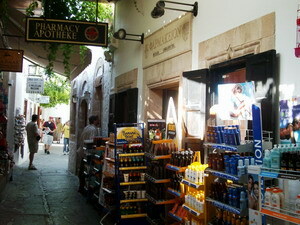 There is also a pharmacy in the village - go to the right of Yanni's Bar and it is on the left. The Pharmacy is open late at night and you shouldn't hesitate to ask for advice if something is wrong. Now - a special word about sunburn and mosquitos! "D-Panthenol", which is very good. It will make life a lot more comfortable for you! When you go out to eat or to the bars, make sure you use mosquito repellent on your legs and ankles! I failed to do this one evening this year and ended up with around a dozen, serious, infected bites around my ankles. I had to go to the pharmacy and was given a Hydrocortisone cream. In the rare case that you or a child is stung by anything (airborne or in the water) the pharmacist will have something to help. If you don't take these problems seriously they can ruin your holiday!